What Should You Do About String Algae? Home > Blog > Ponds 101 > What Should You Do About String Algae? String algae are an issue that every pond owner has to deal with. While algae is acceptable in small amounts, too much of it can be a cause for concern. Below are some things you should know about string algae, including how to keep it under control. String algae are a filamentous form of algae which may also be known by terms such as mat algae, hair algae or pond scum. Scientists refer to it as claudophora spirogyra. They are commonly found near small bodies of water, both natural and manmade, including streams, swamps, waterfalls, ponds and fountains. They frequently grow on rock surfaces and anywhere else they can attach. Their length, texture and color may vary and while they are usually green, they can sometimes appear black. String algae are present in virtually every pond but don’t become visible until it blooms. What Causes String Algae Bloom? 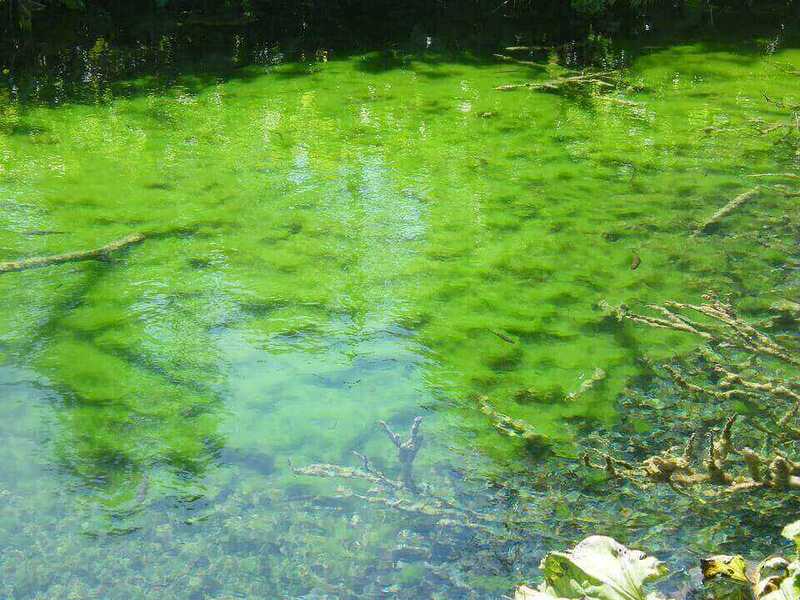 String algae bloom is caused by a number of factors, including wind, human activity, plants and fish. If the pond is allowed to fall into disrepair, and is not regularly and sufficiently cleaned, this can contribute to the presence of algae. Additionally, pond owners who add too many fish or who overfeed them can also cause a boost in the amount algae that is present. Sometimes a bloom of string algae will result from the manner in which plants such as pickerel or water lilies consume nutrients. At various times of the year your plants will consume greater amounts of nutrients, leaving little that algae can use. This results in high nutrients which lead to the bloom. String algae don’t need to be eradicated completely; just kept under control. In small amounts it is actually beneficial since it provides a habitat for snails, tadpoles, dragonflies, fish and other animals, which will also use it as a source of food. It can also eliminate nutrients and in small amounts maintain good water quality. The most straightforward solution to keeping algae under control is to improve your filtration system. This will ensure that nutrients are processed with greater efficiency. String algae can be removed manually, or you could use a solution which is bacterial or chemical based to eliminate it. One of the most popular solutions for excessive algae is barley straw extract. While some pond owners recommend switching the water since it can lower string algae growth, this can actually make the problem worse. A special tool called an ionizer can be used to keep algae under control. Specifically, providing the pond with higher levels of oxygen and a diffuser and pump has been proven to be quite effective, as is installing aquatic plants that will counteract the algae. Some owners simply add additional shade, as there is a relationship between sunlight and algae growth.